HomeBlogClick boardsFan 4 click is here, ready to minimize your fan noise. 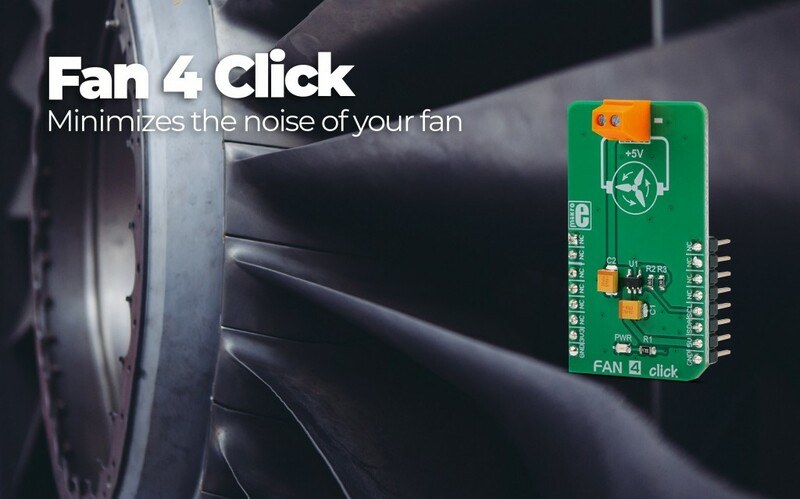 Fan 4 click is here, ready to minimize your fan noise. Being a very compact, two-wire driver, it’s a perfect solution whenever you need a noiseless solution with the variable fan speed. You can use it for cooling of electronic components to get the minimal possible noise. Fan 4 click offers a programmable output voltage regulation, which is primarily aimed at controlling the speed of the 5V DC brushless fan drivers. The Click board™ uses the I2C communication protocol and is equipped by the LTC1695 fan speed controller made by Analog Devices. The amazing startup boost timer ensures a reliable startup of the fan and it’s connected to the output terminal. For more information about this click board, please visit our website.